We’d love your help. Let us know what’s wrong with this preview of Breaking The Habit of Being Yourself by Joe Dispenza. You are not doomed by your genes and hardwired to be a certain way for the rest of your life. A new science is emerging that empowers all human beings to create the reality they choose. In Breaking the Habit of Being Yourself, renowned author, speaker, researcher, and chiropractor Dr. Joe Dispenza combines the fields of quantum physics, neuroscience, brain chemistry, bio You are not doomed by your genes and hardwired to be a certain way for the rest of your life. A new science is emerging that empowers all human beings to create the reality they choose. In Breaking the Habit of Being Yourself, renowned author, speaker, researcher, and chiropractor Dr. Joe Dispenza combines the fields of quantum physics, neuroscience, brain chemistry, biology, and genetics to show you what is truly possible. To ask other readers questions about Breaking The Habit of Being Yourself, please sign up. Lottie Try Hoopla. Its at my library on audio and therefore available to me free on Hoopla. I enjoyed the first book, and I wish I would have stopped there. In this book he finally reveals he is a quack. Don't get me wrong, some of the information is still fascinating and even useful, but it also comes with a fundamental misunderstanding of what 'quantum' means. By throwing around 'quantum' and other buzzwords, he essentially covers up the fact that what he's really trying to convince you is that you can just wish for whatever you want, and as long as you wish it hard enough, it will h I enjoyed the first book, and I wish I would have stopped there. In this book he finally reveals he is a quack. Don't get me wrong, some of the information is still fascinating and even useful, but it also comes with a fundamental misunderstanding of what 'quantum' means. He essentially tells her to do his little 'quantum meditating' technique and imagine what she wants to happen regarding this Italy trip. So she says instead of the typical college-student-home-for-the-summer job she wants to work in Italy, visit 6 cities, spend a week in Florence, and only work for the first 6 weeks and be able to spend the rest of her break back home. He then reminded her that "universal intelligence would orchestrate the way her dream summer would manifest." Really dude? You might as well have said that little italian dream fairies will answer her prayers, or that Ziltoid the Omniscient can bring her to the 10th dimensional version of Italy beyond time and space, where the pasta actually isn't that great anymore, but the artwork is better. So she gets a call from her university that she can take an art history summer course in Italy and they'd only have to pay $4,000 for it. So instead of taking the offer, he told her to tell them to shove it up their asses because their quantum intelligent omniversal creator fairies were going to sort out all the details the way that she had originally planned it, and that an Art History course in Italy is only for suckers. And then we're supposed to believe that she literally did get her perfect dream summer in Italy. Complete with the 6 weeks of working, visiting 6 cities, and spending a week in Florence. So, first of all, I don't believe this happened. Secondly, if it did happen, it would have been a huge coincidence, and certainly not the result of the fact that she "electromagnetically connected to an intended destiny that existed in the quantum" and that "her body was drawn to the future event." I read a book many years ago. I forget the name, but it was about a man with low self-esteem and anxiety who meditated with the intent to access his subconscious mind and change his life, which he did. He called it Life+. I never tried it. Fast forward. Mix quantum physics applications, with accessing your sub-conscious mind and change yourself and your world. Change your mind completely from what you are and don't want to be, to your ideal self. It's not about perfectionism. It's about being who I read a book many years ago. I forget the name, but it was about a man with low self-esteem and anxiety who meditated with the intent to access his subconscious mind and change his life, which he did. He called it Life+. I never tried it. Fast forward. Mix quantum physics applications, with accessing your sub-conscious mind and change yourself and your world. Change your mind completely from what you are and don't want to be, to your ideal self. It's not about perfectionism. It's about being who you are and unloading all that baggage and ALL things in the past that influence your decisions and actions in the now. This is a hands-on practical guide with meditations included to literally change yourself, thus changing your life. I have read a lot of hocus pocus, new age, airy-fairy books over the years, so I'm schooled in all of that, and this is not that. Some useful ideas about learning meditation. Unfortunately this books falls in a category of books that I always dislike - using random scientific discoveries and theories to justify for example meditation. There is plenty of neuroscientific research supporting the benefits of meditation. Using quantum physics to talk about energies changing the universe is not only annoying, it also makes me think the author is doubting his own ideas and is desperate to prove that he is right. What an amazing book!!! If someone told you that you could heal yourself simply by using your mind--even cancer--would you believe or would you laugh? While I've always been a big believer in the power of human mind to do both bad (destroy our body via stress, for instance) and good (to at least reverse that), I would've been suspicious to say the least. But a very close friend of mine recommended this book and bought it for me because stress had been ravaging my body and i've been getting all k What an amazing book!!! If someone told you that you could heal yourself simply by using your mind--even cancer--would you believe or would you laugh? While I've always been a big believer in the power of human mind to do both bad (destroy our body via stress, for instance) and good (to at least reverse that), I would've been suspicious to say the least. But a very close friend of mine recommended this book and bought it for me because stress had been ravaging my body and i've been getting all kinds of things. She has been battling progressive multiple sclerosis for years. She read three of Joe's books and used his meditation techniques for nine months. Her latest MRI results showed no lesions on her spine which she'd had for a very long time. Yes, she managed to change her body! How is that possible? We've all heard of the placebo effect. You get a sugar pill instead of the real medicine and it works solely because you believe it would. Your mind heals you because you trust the doctor. This book has some literally amazing examples from medical literature. How about this? One group of patients does exercises to strengthen muscles (or practices playing the piano) while the other one does it only in their minds. The result is not identical (unfortunately i have to keep doing the push-ups), but pretty darn close. So if your mind believes in something strongly, it can do wonders. But how do you make it believe if nobody gives you a pill? This is where meditation comes into play. Actually, i would call this method sort of a self-hypnosis since you are convincing yourself certain things when you are most susceptible (during meditation). When my friend explained this, my response was, "That is all nice and good, but i've tried meditation several times and i either wanted to fall asleep or my mind kept wandering." My friend convinced me that nobody could be worse than her and that it took a while for her to calm her mind. And there are always ups and downs, even for the author. But it works. So i plunged in, read two books and started meditating. It proved to be easier than i thought because you are not focused on your breathing, which is hard, but are either listening to Joe on youtube or are talking to yourself. It started out really well for me and kept getting better and then i hurt my back and spent some time in a slump. But it's worth doing. When things were going well, i felt much happier and people told me that i looked healthier and happier without knowing what i had been doing. I would also like to go to a workshop if there is one near me. I suggest reading it first because it has a boatload of amazing examples from medical research and trials. It will pump you up. If you know physics, i suggest you skip the quantum mechanics stuff (Joe applies the science of the small to the big and metaphysical). Epigenetics is great. I suggest reading this one second. There is some overlap between the two books but nothing major. And it is much more practical about meditation. Then you can listen the "You are the placebo" guided meditation on youtube. I hope i can continue with all this because it is awesome. Sometimes we give up after a while. I hope i won't. It can be a life-turning book if the reader is ready. I'm 70% in have already felt tremendous impact on how I preceive life in general. It is a solid upgrade from the popular book/documentary The Secret. to live our lives as victims of circumstances. Those reminders were very helpful. The fact that he shrouded them in quack science and bad theology was a bit too weird for me. Um livro que nos ensina muito da mente e do corpo, e da relação entre estes. Sem sem ser um livro de auto-ajuda dá-nos dicas para uma relação harmoniosa ente os diversos elementos que nos constituiem como pessoa. O que eu gostei deste livrio foi o rigor científico, pelo menos, pelo que se sabe até a aos dias de hoje. Se tinha preconceitos em relação aos livros de auto ajuda, esqueça, eu também tinha e perdi-os com este livro. Can the average person understand and apply the principles of quantum physics to create a new reality in his or her life? A reality much more creative and fulfilling than the survival patterns most of us are operating out of? Yes! contends Joe Dispenza in his fascinating new book “Breaking the Habit of Being Yourself”. Don’t let the words “quantum physics” scare you away. Early in his book Dispenza gives the best explanation I have read to date of what quantum principles are all about. More impor Can the average person understand and apply the principles of quantum physics to create a new reality in his or her life? A reality much more creative and fulfilling than the survival patterns most of us are operating out of? Yes! contends Joe Dispenza in his fascinating new book “Breaking the Habit of Being Yourself”. Don’t let the words “quantum physics” scare you away. Early in his book Dispenza gives the best explanation I have read to date of what quantum principles are all about. More importantly, in a detailed step by step manner he explains how we can take this knowledge to implement positive changes in our lives. “When you and I can connect the dots of what science is discovering about the nature of reality, and when we give ourselves permission to apply those principles in our day-to-day existence, then each of us becomes both a mystic and a scientist in our own life,” Dispenza writes in the introduction. This was exciting to me, and I wanted to read more. Dispenza made these mental adjustments, and he passes on the lessons he learned to his readers. He also gives many examples throughout the book of others who have made similar changes. Rather than reading like a dry physics textbook, Dispenza’s colorful descriptions of the quantum process gave me the confidence that I, too, can operate at this level in my own life. Towards the end of the book Dispenza gives detailed meditation instructions to shift the reader’s base thought pattern from the draining “survival” mode to a more fulfilling “creation” orientation. I found this a bit overwhelming, so thankfully he also offers a couple of guided meditation audio files on his website to help with the process. I downloaded and followed one of the meditations, and I can already feel a positive shift inside of me regarding a life change I want to make. For three years this has been taking up space on my shelf. Today was the day to decide what to do with it. "Dr" Joe Dispenza (the quotations are there because Andrew Weil, Deepak Chopra, Abraham Vergese, Atul Gawande, and Jerome Groopman--all mds-- don't seem to need to ram their titles down your throat) is on a quest for legitimacy in a field that parallels science. I have no problem with the alternative world--actually, it's my world. But I am a little turned off by the Manifestation Mob, part For three years this has been taking up space on my shelf. Today was the day to decide what to do with it. "Dr" Joe Dispenza (the quotations are there because Andrew Weil, Deepak Chopra, Abraham Vergese, Atul Gawande, and Jerome Groopman--all mds-- don't seem to need to ram their titles down your throat) is on a quest for legitimacy in a field that parallels science. I have no problem with the alternative world--actually, it's my world. But I am a little turned off by the Manifestation Mob, particularly because they can be judgmental about failure in that same offensive way that the alternative medicine crowd can be. (Once, during a lecture about health after a 20 year old woman painfully made her way to the front of the room suffering from chronic Rheumatoid arthritis I overheard an acupuncturist murmur under her breath: "It's because she's so angry." That kind of blaming is rife in the medical world--alternative or not.) Are you sick? It's because you're not manifesting health! Stop it! Actually, this book isn't all that terrible, it's just the same old same old that I've read a hundred times: you are what our think and here's the quantum explanation why. I call it quantum muck. It's the kind of thing that has science wannabes huffing and puffing words like "quackery" and "pseudoscience". Fer good reason. If you want to change your life, yes do change your thoughts. There's plenty of great studies out there to suggest there's more than a simple correlation in the body-mind connection. But jeez-loueez 340 pages ? It could be easily converted to 25. Wish it had been. By the time I got to chapter 11 and the beginning of the four week "change your life" program I was completely out of patience with this guy and his writing. I had no interest in hanging out with him for five more minutes. The reasons for this are many and manifold: his writing is uninspired, his sciency-stuff smacks of b.s., his understanding of meditation is Seven-Eleven fare (cheap variety), his understanding of the purlicues of the mind is mere meat and potatoes, and his magical manifestation system is vivisected. What does that mean? Once about five years ago I took a tour of the local Temple of Scottish rites (masons). The guy who led me through it was the most generous tour guide I've ever had--what a great barker for an organization. But I noticed something weird: all the decorative symbolism in the building was masculine in nature: the sun (but not the moon), daylight (but not night.) The aim for glory there felt unhealthily lopsided. There's a cyclicity and a polarity that must be balanced for the universe to be satisfied: all magic needs to be done and undone, all magicians know you need manifesting spells and also banishing spells. With the art of manifestation you have to satisfy the cyclical nature of reality: stuff for self, stuff for others. Without that "other" part you've got growth without decrease, which is basically cancer. This book is both, a very good and very bad. It is good because it contains some useful and scientifically valid information about human brain. For example, it explores topics such as neurogenesis, neuroplasticity and different brain waves. Next, it also provides information about meditation and its benefits along with a very simple step-by-step plan on how to start with it and how to use to shape one's personality and habits. Finally, The book offers useful information and tips on how to change This book is both, a very good and very bad. It is good because it contains some useful and scientifically valid information about human brain. For example, it explores topics such as neurogenesis, neuroplasticity and different brain waves. Next, it also provides information about meditation and its benefits along with a very simple step-by-step plan on how to start with it and how to use to shape one's personality and habits. Finally, The book offers useful information and tips on how to change and form one's personality and habits through various ways, meditation included. That being said, the book also contains a lot of nonsense that is not proven by any real science. The author often talks about topics such as quantum fields, quantum entanglement, time and space and other topics. All these thing are real, based on our current knowledge of physics. However, the author is using these terms in a way that serves the book, not the real evidence. Put simply, the author talks about these topics while bending and adjusting facts to fit into his "story". In other words, part of the book is pure fiction and fantasy. A synergy of quantum physics and spirituality, this book bears several readings. Read well along with Eben Alexander's Proof of Heaven. Dispenza ends with practical help to meditate effectively. I'm starting! This book is so interesiting because explain a lot of things that we consider averege and explein in a way we are able to help our jorney in this world. Удивительная книга. Авантюрная смесь квантовой механики, биологии, неврологии, медитации, религии и шизофрении. Основная идея состоит в том, что материя суть энергия. Мозг тоже генерирует энергию. Следовательно, мы можем через сознание и эмоции управлять матрицей бытия, достигая своих целей. Почему-то одного сознания или одних эмоций недостаточно, нужно именно их сочетание для генерирования когерентных волн (что, по мнению автора, усиливает влияние на мироздание). Все это доказывается через предел Удивительная книга. Авантюрная смесь квантовой механики, биологии, неврологии, медитации, религии и шизофрении. Все это доказывается через предельно сумасшедшие эксперименты, результаты которых опубликованы в ненаучных журналах: разворачивание спиралей ДНК мысленным усилием, влияние молитв на исцеление больных сепсисом в *прошлом* (то есть молимся сейчас, а в прошлом больным *становилось* от этого лучше). Все это снабжается традиционными бытовыми историями и байками, как люди становились богатыми, достигали своих целей и счастья после применения медитативных техник Доктора Джо. Что любопытно, описываемые техники медитации вполне работают. Если каждый день медитировать около часа, то это даст свои плоды в любом случае. Польза медитации в большинстве случаев — научно доказанный факт. К сожалению, после неплохого начала, медитации превращаются в молитву, когда Доктор Диспенза добавляет шаг 4: “передача проблемы высшим силам”. Надо сформулировать проблему, помолиться, и ждать. Прекрасная стратегия, я считаю. Доктор Джо Диспенза — великолепный бизнесмен. Книга имеет прекрасные ревью и рейтинги. Вся негативная информация в сети тщательно вычищается. Вы не найдет страницы Wikipedia или чего-то подобного. Продано 4,000,000 копий. Карл Саган ворочается в гробу и скоро восстанет из мертвых, чтобы дать интервью на эту тему. Only on chap 2 and am blown away. Finally quantum physics and manifestation explained in a way that resonates and shows me HOW to step into being the quantum creator that we all have access to. I just want to tell everyone about this book! this is my new favorite book!! Joe Dispenza really can explain these topics in easy to follow and interesting ways. If there is anything in your life that you have ever wanted to change, read this book. Забавный псевдонаучный бред. Приправлен примерами случайный совпадений, как доказательствами действенности пропагандируемых методов. Fantastic book. Coming to this with a background in yoga and buddhism, this book really helped me make sense of the way the brain works, meditation and how to really make change. Highly recommend. Книга про позитивне мислення, квантову теорію у дії та медитацію як спосіб досягти безлімітного щастя. Найбільший її плюс у майстерності автора пояснювати складні речі простими словами і близькими кожному читачу життєвими ситуаціями. Що я маю на увазі? Факти та теорії з квантової фізики, нейробіології та психології Диспенза розкладає і пов'язує між собою так, наче грається у дитячі кубики з літерами. Тож читання стає не лише насиченим, але й захоплюючим. "Керуй своєю підсвідомістю" схожа на свого Книга про позитивне мислення, квантову теорію у дії та медитацію як спосіб досягти безлімітного щастя. Author, with all the love and respect to your person, tells you outright – if you want to be someone else – stop being yourself. For instance, if you are, like me, a bit on the lazy side, and wish you could enjoy working more, so that you’d not feel too lazy before you even started it – start being that person. How, you ask, you’re still lazy? Well, that’s the damn thing. By associating things, we create shortcuts for them in our brain, to hell with the terminology, and end up unconsciously following patterns, rather than actually experiencing what’s before us. For me, my first jobs were gruesome hard work. So work equals hard, equals tired, equals don’t want to, equals lazy. Today my work is far less demanding, and yet I’m still lazy, because that’s what word “work” evokes in my brain. Author, thus, leads us through series of explanations, and meditations, of how to cut that cord, and make a new one. Basically, how to become your better self, or stop being your lazy self. The other point he made was autopilot. Our brain trains our body to do, and react, and eventually body takes over. For instance, I might not be able to tell you my PIN, but I will enter it easily. The day I realized I can’t remember the numbers was the day I met a different key-pad. We do that with far more things than we imagine. Our body learns that, say, we react like this to this kind of comment, and so – we react. Rather than being present, and making a conscious decision, after a proper evaluation. This book is brilliantly written and easy to follow and understand, with handy exercises throughout. There is a lot of information in one book though and as I listened to it on audio, I felt that I wasn’t properly allowing my brain the time to let all the information sink in, so I will be definitely listening to this one again (and again). The narration performance was very clear, precise and exceptionally performed, though due to the heavy content of the book, I honestly think I would have prefe This book is brilliantly written and easy to follow and understand, with handy exercises throughout. The narration performance was very clear, precise and exceptionally performed, though due to the heavy content of the book, I honestly think I would have preferred to read it in paperback. Definitely recommend to anyone trying to break a habit of any kind or if you just want to learn how to train your mind to be more positive, accepting and thinking in a manner that will help you achieve your goals and not ‘chase’ your dreams, but to LIVE them. I definitely changed my thought patterns whilst listening to this (which is why I want to listen to it again). There have been many major positive changes in my life whilst I was listening to this book. Considering the place I was in my life a few days ago, I am pleasantly surprised at the impact this book has made. This book is all about using meditation to break bad habits and create good ones. I got some interesting ideas from the book, but some stuff I will leave. For example, he advises you build up to an hour of meditation every day, I imagine that would be impossible for very busy people and/or people with kids. Personally I just can't sit that long without fidgeting and having my legs hurt. The kicker is that he tells you to go to his website for the guided meditations, but they cost more money on to This book is all about using meditation to break bad habits and create good ones. I got some interesting ideas from the book, but some stuff I will leave. For example, he advises you build up to an hour of meditation every day, I imagine that would be impossible for very busy people and/or people with kids. Personally I just can't sit that long without fidgeting and having my legs hurt. This book is incredible. 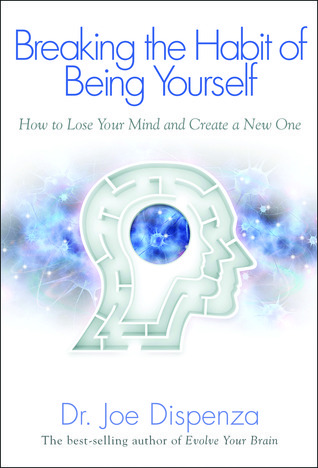 Dr.D brings together thinking in a scientific yet practical way to help you change the habits of being yourself. Brilliant reference book, clever man. I attended his level 1&2 training, which was well worth it. Dr Joe Dispenza is an international lecturer, researcher, corporate consultant, author, and educator who has been invited to speak in more than 33 countries on six continents. As a lecturer and educator, he is driven by the conviction that each of us has the potential for greatness and unlimited abilities. In his easy-to-understand, encouraging, and compassionate style, he has educated thousands o Dr Joe Dispenza is an international lecturer, researcher, corporate consultant, author, and educator who has been invited to speak in more than 33 countries on six continents. As a lecturer and educator, he is driven by the conviction that each of us has the potential for greatness and unlimited abilities. In his easy-to-understand, encouraging, and compassionate style, he has educated thousands of people, detailing how they can rewire their brains and recondition their bodies to make lasting changes. In addition to offering a variety of online courses and teleclasses, he has personally taught three-day Progressive Workshops, five-day Advanced Workshops, and seven-day Week Long Advanced Retreats in the U.S. and abroad. Starting in 2018, his workshops became week-long offerings, and the content of the progressive workshops became available online.